Whale sharks are the largest fish species on Earth—up to 45 feet long—and five of them were spotted off the coast of Anna Maria Island last weekend. Known for their massive size, gentle personalities and polka-dot coloring, whale sharks occasionally visit local waters, likely to feed on blooms of plankton or fish eggs. "It's important to understand where these sharks migrate, feed and carry out other key parts of their life cycles, so that [we can] successfully protect them," says Dr. Bob Heuter, Mote Marine Laboratory senior scientist and the director of the lab's Center for Shark Research. "We've placed tracking tags on numerous whale sharks at a major feeding aggregation of Mexico's Yucatan Peninsula, but it's rarer that we can find and tag these huge fish off the Gulf Coast." If you see a whale shark in the Gulf, Mote encourages you to call Heuter at the Center for Shark Research immediately. He and his team want to attach a special satellite tag to the fish, which will collect data on their location, as well as the temperatures and depths they encounter in the ocean, over the course of a six-month period. Scientists will receive real-time GPS information from the tag while the shark is traveling; once it's removed, extensive data can be collected. "It's exciting that we're hearing reports of five of [these whale sharks] in one area—it suggests they might be feeding on something in a special spot," Heuter says. If you're out on your boat and spot a whale shark, report it immediately—or within 24 hours, at most—to Mote at (941) 302-0976. 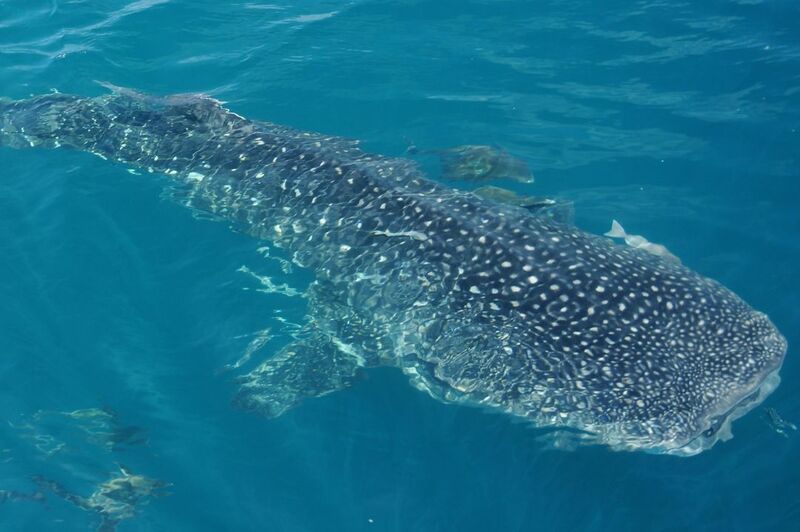 Note the number of whale sharks spotted, date, time, location and, if possible, the exact GPS coordinates.